Does anyone really enjoy eating conversation hearts? I find them chalky and very artificial tasting. But, they are cute and such a fun idea to turn other things into. Kelly over at StudioDIY has been turning tons of adorable things into conversation hearts and it got me thinking about cupcakes. You can use any boxed cake or from-scratch recipe to make these cupcakes. To make mine extra celebratory, I made Funfetti from scratch. Mix up the batter as directed and line you cupcake pan with paper liners. A lot of Pinterest links showed people using marbles, but I didn't have marbles. But, I do have tin foil! Tear off about a 2 inch wide piece of tin foil. Using kitchen scissors, cut that strip into three pieces and roll each piece into a ball. Each foil ball should be about the size of a marble. Place each ball in-between the liner and the side of the cupcake cup. Fill each liner with batter about 1/2 full. Too full and the batter will overflow and not look heart-shaped. Too little and the cupcakes just look sad. See? Trial and error. Give each foil ball a poke down with your finger and bake as directed. Cool completely before frosting. Frosting: Mix up your favorite vanilla frosting recipe (I used one from Joy the Baker's Cookbook which is fabulous). Spoon about three tablspoons of frosting into a small bowl, and separate the remaining frosting evenly into three bowls (or four bowls if you want four different colors). Apply a small amount of food coloring into each bowl of frosting to create a pastel colors. I used pink, blue, and green. Mix the coloring in and apply to each cupcake with a spoon or offset spatula. 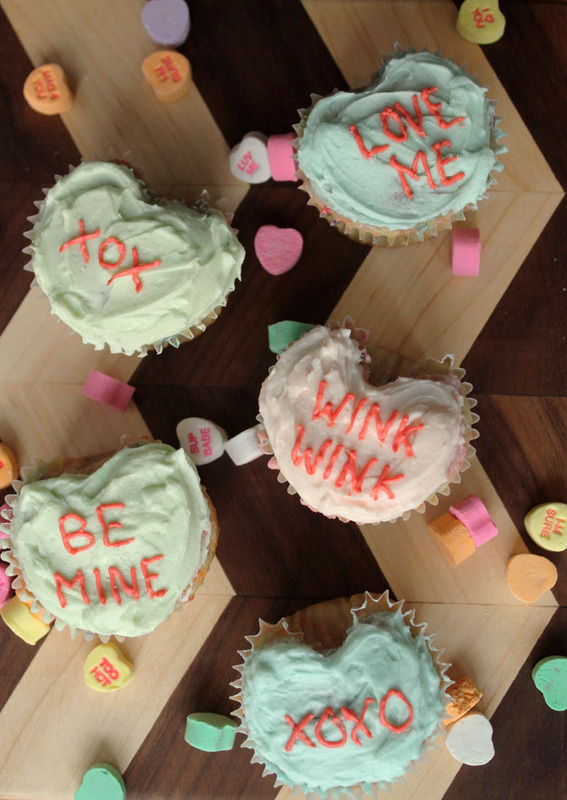 Apply red food coloring to the bowl with the small amount of frosting to create the text color. You'll want a dark red, so more food coloring than before. Fill a pastry bag or a sandwich baggie with the red frosting and cut off a very tiny hole. Pipe saying that can be found on conversation hearts and you're done! Even if you don't want to go through the trouble of making them heart shaped, you can still frost circular cupcakes to look like conversation hearts. Still cute! These definitely might look very homemade, but I kind of like that. Not everything needs to look like it walked out of a bakery and was made by professionals. People will be more excited with the effort you put in than if they looked perfect!